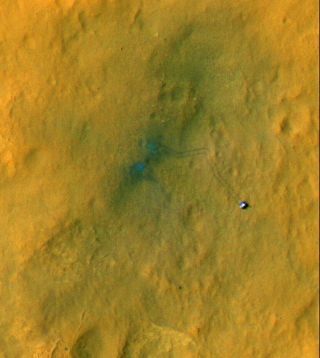 Tracks from the first drives of NASA's Mars rover Curiosity are visible in this image captured by the Mars Reconnaissance Orbiter. The rover is seen where the tracks end. The image's color has been enhanced to show the surface details better. Image released Sept. 6, 2012. NASA's Mars rover Curiosity has wrapped up its first full month on the Red Planet and is gearing up its robotic arm to reach out and touch Martian rocks for the first time, scientists say. This week, Curiosity has been steadily trekking east toward its first major science destination, a spot called Glenelg, where scientists are keen to investigate three different types of Martian terrain that can be found there. But first, the rover will take a weeklong hiatus from driving to test the instruments on its 7-foot-long (2.1-meter) robotic arm. Mission managers first flexed Curiosity's robot arm on Aug. 20, to make sure the mechanical appendage had survived the journey to the surface of Mars. Now, the rover will spend roughly a week testing and characterizing the various instruments attached to its arm, NASA officials said. Curiosity's robotic arm holds some of the mission's most sophisticated tools, all mounted on a 66-pound (30-kilogram) turret that spans nearly 2 feet (60 centimeters) across. The rover's hand-like turret carries five different devices, including a drill that can dig 1 inch (2.5 cm) into rocks, a sample collector and a scoop. The turret also houses a powerful camera, called the Mars Hand Lens Imager (MAHLI), that is designed to make microscopic observations, and an instrument, called the Alpha Particle X-ray Spectrometer (APXS), that will be used to analyze the composition of Martian rocks and soil. During the instrument checkouts, MAHLI and APXS will be calibrated to prepare them for the science activities planned once Curiosity reaches Glenelg. For instance, mission managers will train MAHLI's eyes on a control sample, one whose material type is known, so that scientists can gauge the accuracy of the instrument. MAHLI will also be maneuvered around to take a panned set of images of Curiosity's underside. "This will be the first time that we use the MAHLI imager to take images of the belly of the rover," said Matt Robinson, lead engineer for Curiosity's robotic arm testing and operations at JPL. So far, Curiosity has driven a total of 358 feet (109 meters) on Mars, and the rover is currently positioned roughly 269 feet (82 meters) away from its touchdown point, which has been named Bradbury Landing in honor of science fiction author Ray Bradbury, who died in June. After the instruments on Curiosity's robotic arm have undergone their calibrations, Curiosity will continue on to Glenelg, which is still weeks away, Watkins explained. Along the way, mission managers are planning to make one or two stops to perform chemical and atmospheric observations, and, if the rover encounters suitable terrain, to try scooping some of the Martian soil. When Curiosity reaches Glenelg, the rover may begin using its drill for the first time, said Joy Crisp, Curiosity's deputy project scientist at JPL. Still, with NASA's most ambitious planetary expedition passing its one-month mark, mission managers are pleased to report that it has been a very smooth ride so far. "Actually there have not been any significant wild cards come up — maybe the wild card is how well it works," Watkins said. "It's actually gone surprisingly well." The $2.5 billion Curiosity rover touched down on Mars on Aug. 5 and is expected to spend at least two years exploring its landing site at Gale Crater. The rover is designed to determine whether the Martian environment can, or ever could, support microbial life. Follow Denise Chow on Twitter @denisechow or SPACE.com @Spacedotcom. We're also on Facebook and Google+.